Pra Somdej Pim Yai Nuea Pong Bailan (Black Parchment Powders) - Luang Por Jong, Wat Na Tang Nork - released in Year Circa 2483 - 2493 BE. This Extremely Rare Pra Somdej amulet is made from black Bailan Parchment Powders, and is an exemplary exhibit, and extremely attractive in appearance. 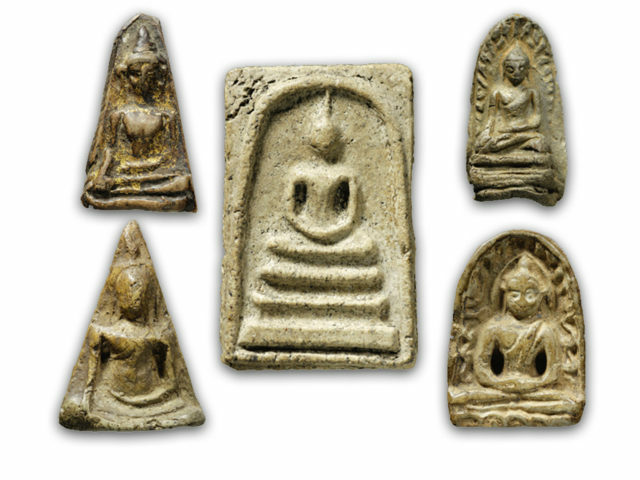 Luang Por Jong made amulets between the years 2483, to 2507 BE, after which Luang Por passed away in the year 2508 BE. 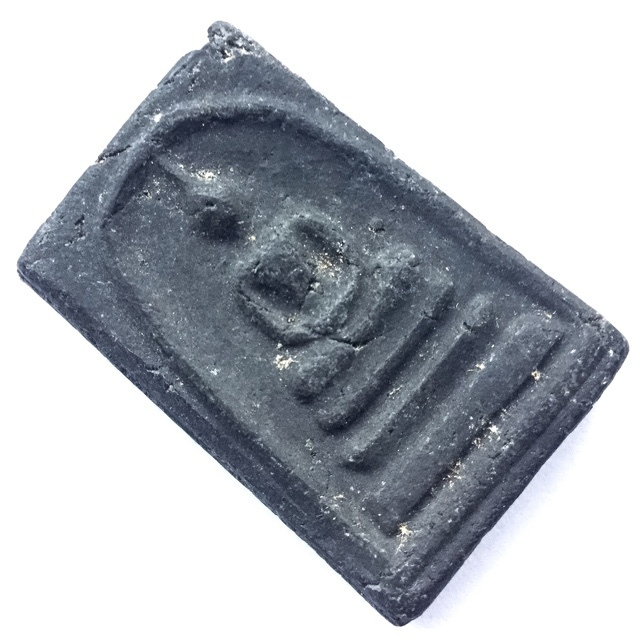 This ancient amulet has impeccable features, and is highly attractive in matt black Bailan powders, with a pored surface from climatological and atmospheric changes over the passage of time, revealing a subtle beauty to the relief features of the Votive Image. The rear face has the Yant Ma A U for Kong Grapan Chadtri and Klaew Klaad protective Magic, and the words 'Gan Pai' which means 'Prevent Disaster and Danger', and the words 'Luang Por Jong' in Thai embossed into the surface of the amulet. A true aficionado of Sacred Clay Amulets always examines the edges of an amulet, to judge its aging characteristics. The changes in climate and humidity cause swelling and shrinkage 'scars' visible as cracks and crevices on the sides of the amulet. This is one of the ways that aficionados learn how to judge the age and authenticity of Sacred Powder Amulets. 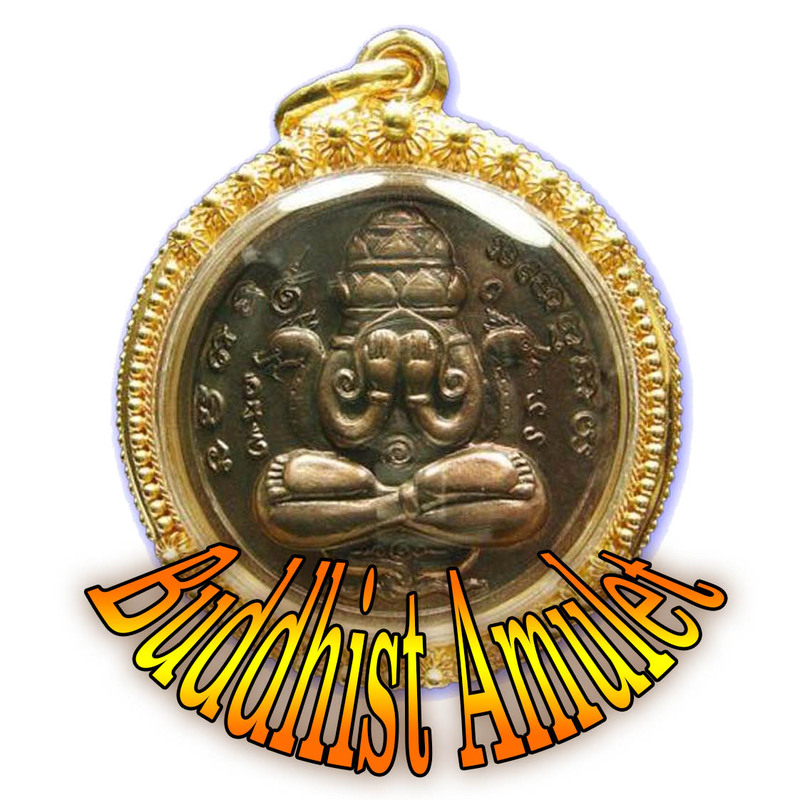 A classic essential rarity and perfect Buddhanussati Heirloom Amulet for Kong Grapan Chadtri Klaew Klaad Maha Lap Metta Mahaniyom, and Serm Duang Blessings, and a most exemplary showpiece for any collector's showcase. The rear face of the amulet has the words 'Gan Pai' (Prevent Danger) in red colored rubber ink stamp of authenticity still visible stamped on the hardened agéd dry surface of the votive tablet, from Wat Na Tamg Nork. The Sacred Clay reveals its age and status through its features. Luang Por Jong lived from 2415 BE to 2508 BE, and was one of the previous generation of attained Masters, of National and International Fame. 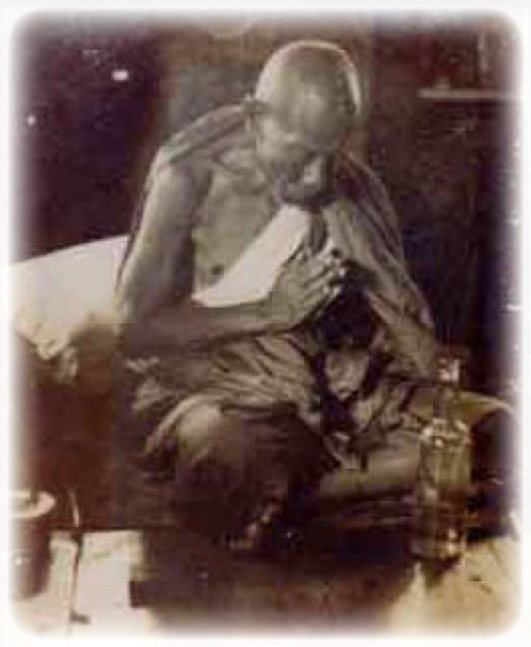 Known for his Kong Grapan Chadtri Klaew Klaad protective amulets handed out to soldiers during the Indochina Wars. His Pla Tapian Maha Lap Kaa Khaay amulets are also renowned for their ability to instigate good commerce and prolific sales quotas with sales persons. He was famous for many different amulets, and released many, including the Takrut Hnaa Phaag Suea (Tiger Forehead Skin Yantra Scroll), the Pla Tapian Koo, and his Many Sacred Powder Amulets, such as this Pra Somdej Bailan from the Indo-China War Era. His Guru Monk Coin amulets are highly sought after and revered, and have a well documented 'Dtamra' (Catalogue of the Pantheon), allowing for collectors to easily authenticate and research the origins of these amulets. Known for his Kong Grapan Chadtri Klaew Klaad protective amulets which were handed out to protect Thai soldiers during the Indochina Wars, his Magic Ring Amulets, Pra Somdej and other Sacred Powder Votive Tablets, and Powerful Takrut are famous as they are rare to find. Luang Por Jong's Pla Tapian Maha Pokasap Lap Kaa Khaay Gold-Silver Fish amulets, are also renowned worldwide, for their ability to instigate good commerce and prolific sales quotas with sales persons. Recommended Uses:Protection, Wealth, Evade Danger, Auspicious Karma.